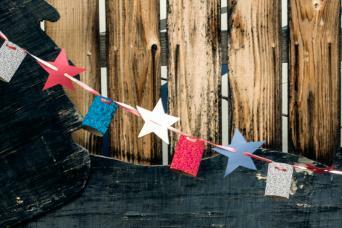 Make 4th of July crafts outside! 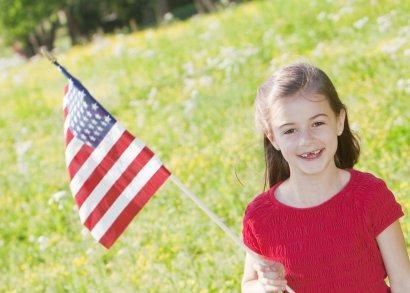 You can celebrate Independence Day with 4th of July crafts for kids. Whether you have a big group of children to entertain at a family picnic or just need a fun activity for your own kids, these crafts will make it easy to celebrate in style. Age appropriate: If a craft is too easy, kids can get bored and restless. If it's too difficult, they may get frustrated and lose interest. You can keep everyone focused by picking a project that fits the kids' skill level. Quick: Unless you're working with pre-teens or older kids, you should expect no more than half an hour of focused attention. It's a good idea to keep kids' craft projects short and sweet. Creative: The best kids' craft projects allow for creativity. Make sure there are plenty of options for kids to exhibit their artistic flair. This craft is appropriate for kids of all ages. Older kids may need minimal adult supervision. Younger kids will need help with the hole punch and scissors. Use the stencil to trace star shapes on construction paper. You can create your own stencil ahead of time or purchase one at your local craft store. It's a good idea to have a stencil for each child. Use the punch to make two holes in each star. Use patriotic paints to paint the sections of cardboard tube. When the tubes are dry, apply glue and glitter. String the ribbon through the tubes and stars, creating a pretty pattern. Hang the garland and enjoy! This craft is appropriate for school-aged kids. Preschoolers may enjoy making a puppet too, but it's best to keep the project as simple as possible when working with younger kids. Draw a suit on the front of the paper bag. It may help to show kids a picture of Uncle Sam, but it's also fun to let them get creative. Help kids cut a beard shape out of the white felt and glue the shape to the bag. Glue the googly eyes to the bag, and use markers to draw a nose and mouth. Cut a top hat out of construction paper, and glue it to the puppet's head. Use star stickers to decorate the hat and suit. 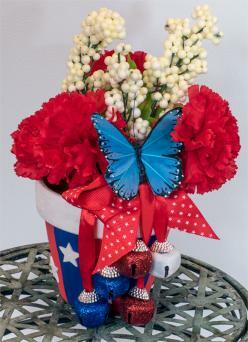 This craft makes a great 4th of July table centerpiece and it's easy for kids of all ages to get in on the fun. For younger kids, consider setting up the craft outside and dressing them in smocks to protect their clothing. You can find terracotta pots and markers at your local craft store. Allow kids to decorate the flower pots using the markers. They can draw American flags or other typical 4th of July symbol, or they can simply make abstract designs. Once the pots are dry, help the children plant the flowers in the pots. Tie a patriotic ribbon around the pot, and enjoy!